Milan Cathedral (Duomo) and the main square (Piazza Duomo). This is the fifth largest cathedral in the world. 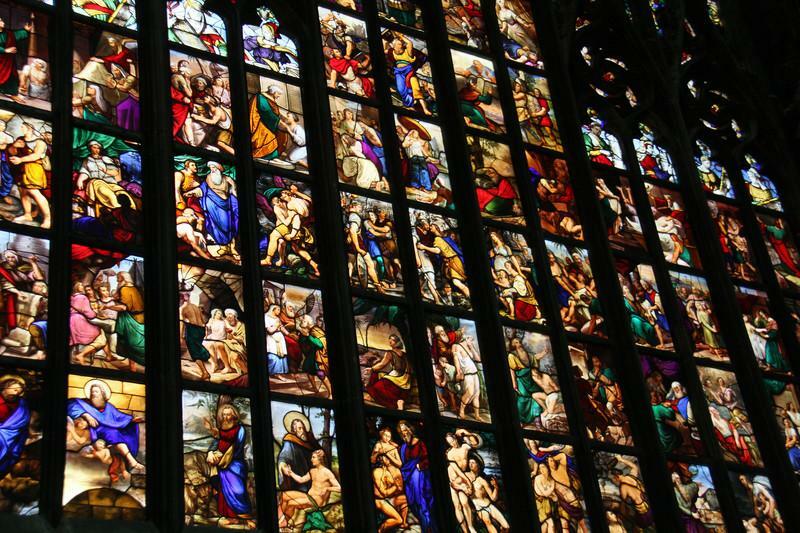 Be sure to visit Milan Cathedral roof top terrace and wander among the intricate sculptures and designs. Tickets are sold with open dates to the church, but specific date tickets are necessary for the roof top terrace. Afterward, shop and stroll through the Vittorio Emanuele II Gallery – don’t miss out on the opportunity to participate in the local tradition of spinning on the bulls ball’s on the mosaic floor tiles. 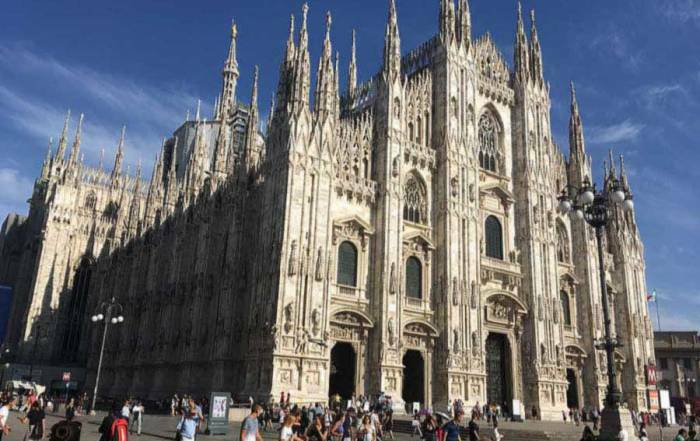 The Milan Cathedral Museum, the Royal Palace and the Museo del Novecento for modern Italian art are on the plaza here too. 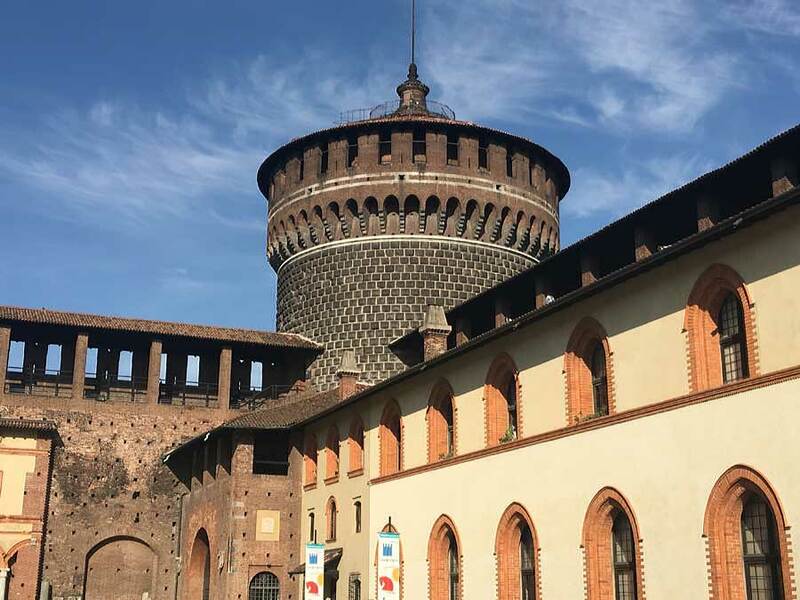 Walk the Via Dante – a pedestrian walk way between the Piazza Duomo and the extensive grounds of the Sforza Castle (Castello Sforzesco). Sforza Castle and its gardens are free admission, but there is a small fee for its museums. At the far end of the grounds is the Peace Arch (Arco della Pace). 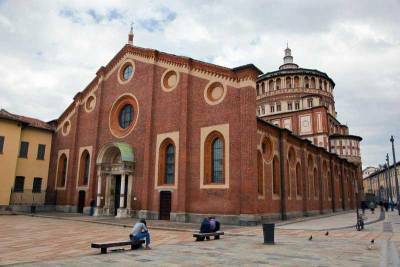 See the Leonardo Da Vinci’s Last Supper in the Cenacolo Vinciano beside Saint Mary of the Graces (Chiesa di Santa Maria delle Grazie). Reservations are required to view the Last Supper. 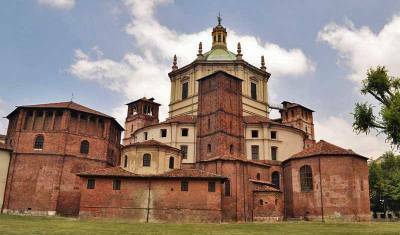 Book tickets online with Orana Travel or try Viator’s Small-Group Milan Walking Tour with da Vinci’s ‘The Last Supper’ Tickets. Closed on Mondays. Scala Theater and Museum Tour. You can book a Scala Theater museum ticket online, which includes viewing the theater from the third level box seats. A guided tour gets you in to more areas and costs about twice as much. Guided tours have set times. In front of the theater, see Leonardo da Vinci’s statue in the Piazza della Scala. 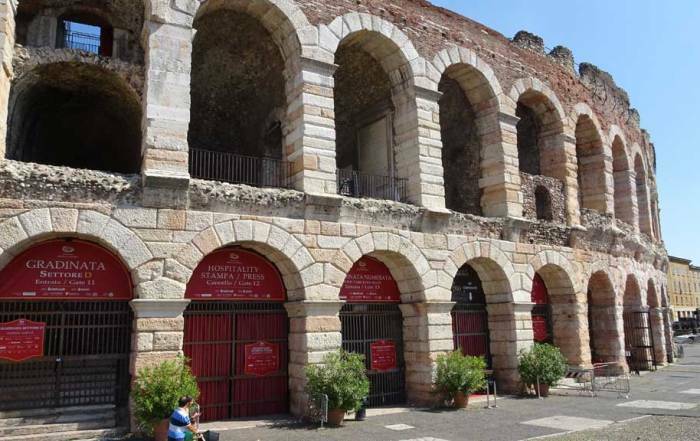 The Scala Theater is a a 5 minute walk from the Milan Cathedral. Brera Picture Gallery (Pinacoteca di Brera) – the main art gallery for the city. Piazza degli Affari – see the controversial L.O.V.E. sculpture outside the stock market. This larger than life sculpture of a human hand is also know as the Middle Finger Sculpture. Watch the rich do their shopping along Via Montenapoleone, Via Della Spiga and Via Manzoni. Church of San Maurizio al Monastero Maggiore – called the Sistine Chapel of Milan for its 16th century frescoes by the renaissance painter Bernardino Luini. Free admission. 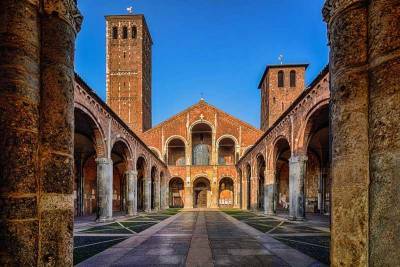 Basilica di Sant’Ambrogio – golden altar with a mosaic of Christ behind it. Also see the fourth century marble sarcophagus of Flavius Stilicho and the crypt of Saint Ambrose. Church of Santa Maria presso San Satiro – a small 15th century renaissance church which uses perspective to make the altar appear much larger than it actually is. Basilica San Lorenzo Maggiore has an ossuary where bones are stacked because there is no room any longer for its cemetery. The Roman ruins of the Columns of San Lorenzo are in front of the church. UNA Maison Milano – just a few steps from the Milan Cathedral in Old Town Milan. B&B Hotel Milano Sant’Ambrogio – in Old Town Milan near the Last Supper mural. 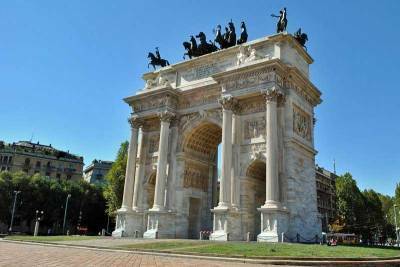 Heart Milan Apartments – Several apartment options near the main train station. Holiday Inn Express Milan-Malpensa Airport – 40 minutes from Old Town Milan on the Malpensa Express train. Milan Central Train Station – built by Mussolini during the height of Italian fascism after World War I. The train station is a gigantic architectural monument. Monumental Cemetery (Cimitero Monumentale) – a variety of crypts, tombs and headstones similar in many way to La Recoleta in Buenos Aires. 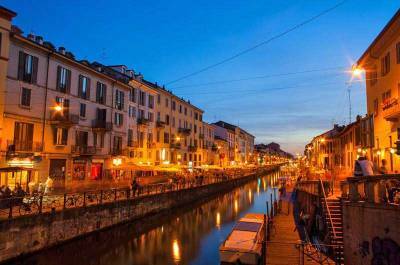 Naviglio Grande and Naviglio Pavese, the canals of Milan. A great area to have dinner. San Siro Stadium – for soccer fans. 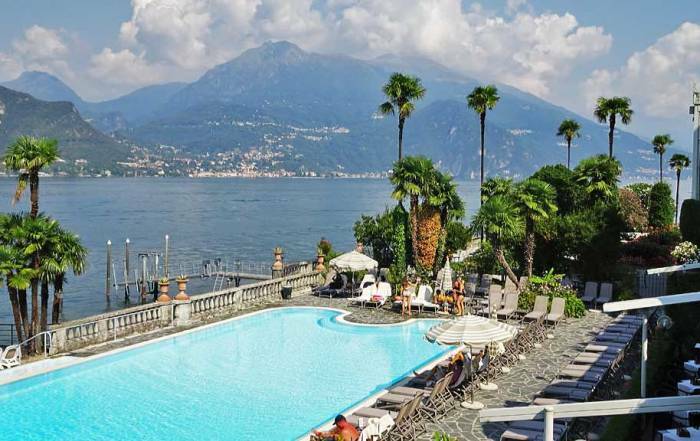 Lake Como Day Trip from Milan – The lakeside towns of Bellagio and Varenna are small and picturesque. Most day trips from Milan take you to Como by bus. Then you take a boat to Bellagio. After that you bus back to Milan. For more adventurous travelers, travel independently. 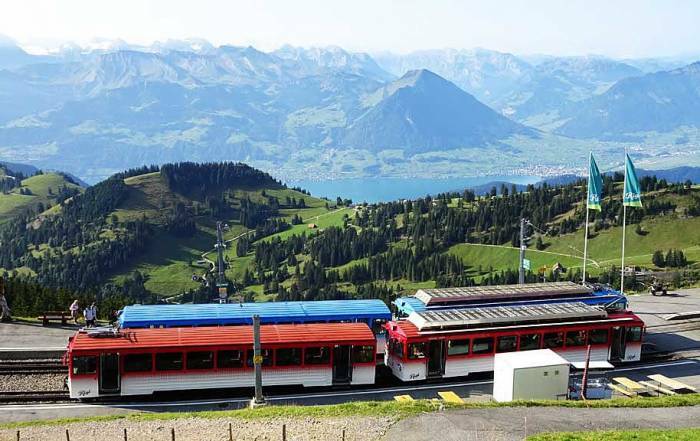 Book a couple days in advance with TrenItalia for the fare from Milan Centrale to Como San Giovanni and a return ticket from Varenna-Esino. When you arrive in Como, buy your ferry ticket to Bellagio. You can’t buy these online. When you arrive in Bellagio buy your ferry ticket to Varenna. Varenna is on the less traveled side of Lake Como. After your visit to Varenna, walk less than 10 minutes to the Varenna-Esino train station. Use your online reservation ticket back to Milan Centrale. St Moritz, Switzerland Day Trip on the Bernina Express. Aperitivo bars – enjoy drinks after work and appetizers are often included for free. It’s a common practice in Milan. You may find that the appetizers are a meal in themselves. Starbucks Reserve Roastery – the idea for the creation Starbucks came about on a visit to Milan. Starbucks roasts their own coffee here is an amazing cafe that even Italians like. It’s the only Starbucks in Italy and it’s magnificent. Panzerotto – sweet deep fried bread with tomato sauce and mozzarella folded inside. July and August are the height of summer for Milan weather. The average high temperatures are 85 F (29 C) and average lows are 64 F (18 C). Average highs in December and January are 43 F (6 C) while average lows are at or just below freezing. The rainiest month is October. 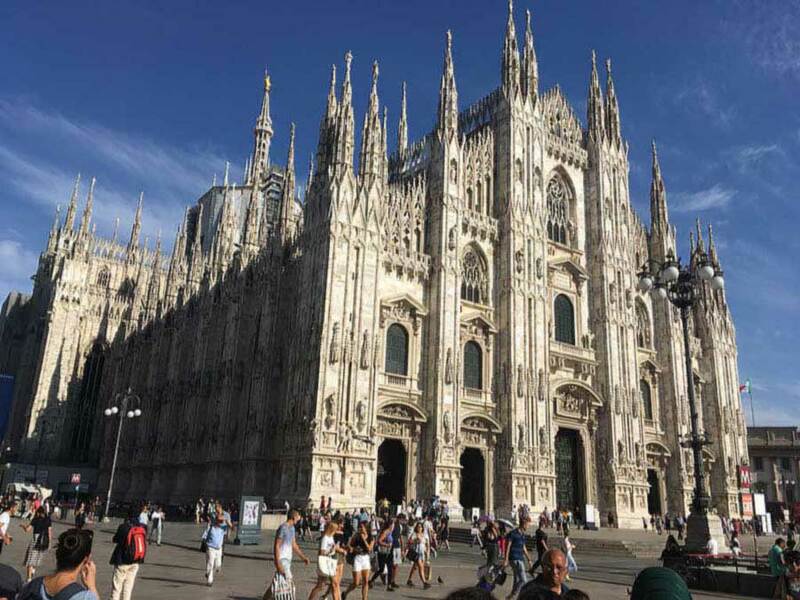 The best time to visit Milan may be June or September, when temperatures are comfortable, while the peak tourist summer season is avoided. 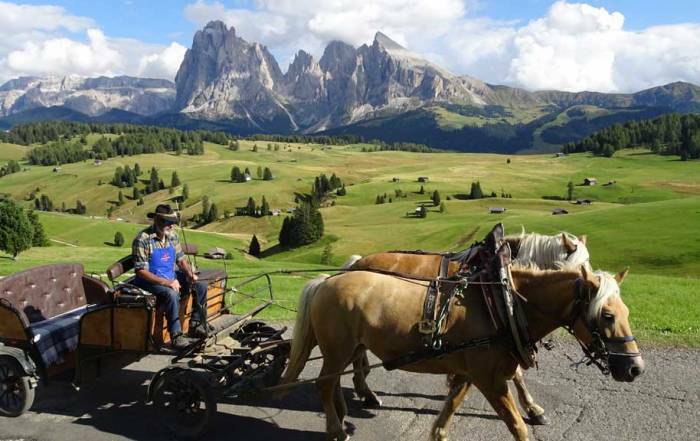 Milan Malpensa Airport (MXP) is about an hour from downtown Milan. The T2 terminal is for EasyJet. All other airlines use the T1 terminal. A cab ride an expensive way to get to Milan from the airport. Fortunately the Malpensa Express train runs a frequent schedule between the airport and the downtown station either Milano Cadorna or the main train station at Milan Centrale. Reservations aren’t required. Shuttle buses are another way to get to Milan from the airport, but the fare isn’t a lot less than the Malpensa Express. Milan also airports at Bergamo and Linate, which are an hour from downtown. The Bergamo Airport sees heavy traffic from other European countries, mainly through the Ryanair airline. There is an inexpensive shuttle bus from Bergamo to downtown Milan. Linate Airport is close to downtown, but has limited international flights. The main train station at Milano Centrale connects Milan with the rest of Italy and Europe. The M2 on the metro system connects Milano Centrale with Milano Cadorna in the Old Town. Subway cars travel every few minutes between these two popular stations. 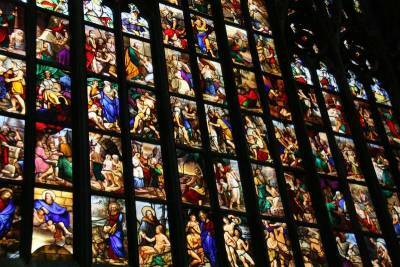 Leonardo Da Vinci lived and worked in Milan before his more famous paintings were done in Rome. Da Vinci also designed Milan’s canals back in the days when Milan was a major port on the Mediterranean Sea. Today Milan has an urban population of more than 5 million and is the main financial and commercial center of Italy. It is also a world renowned fashion center. This gives Milan a very different aspect from other cities in Italy.